Walt Disney was fascinated by the turn of the century, the era in which he grew up. By 1960 he had already used this setting in a handful of his films. Every guest who entered Disneyland walked down Main Street U.S.A., a tribute to his hometown the way he remembered it as a boy. So it is easy to see why he would want to adapt a popular book from his childhood, Pollyanna by Eleanor H. Porter, into a feature film. David Swift started his career with Disney as an in-betweener in the animation studio. 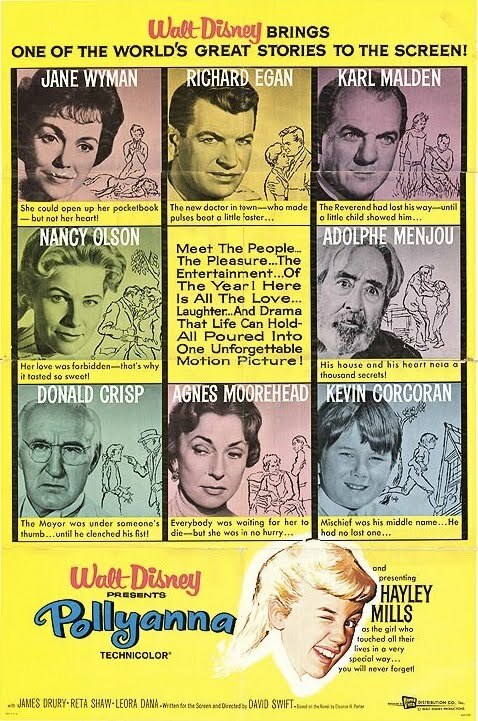 He went on the become a television director for other companies, but Walt saw his potential as a feature film director and gave him his big break with Pollyanna. Walt handed him the book and Swift returned with a treatment that Walt instantly gave the green light. 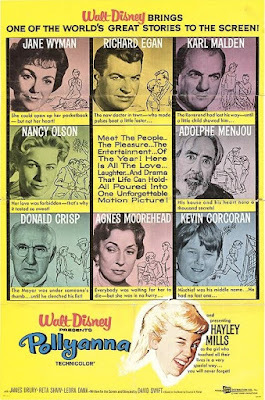 Walt went all out, getting an all star cast to fill the main roles including Jane Wyman, Karl Malden, Agnes Moorehead, Kevin Corcoran and Nancy Olsen, who was cast through a personal phone call from Walt Disney after a five year hiatus from film. Hayley Mills, daughter of famous actor John Mills, was cast in the title role when Walt saw a British film she made with her father called Tiger Bay. The movie had some location shooting in Santa Rosa, with the rest filmed at the Disney Studio and at Warner Bros.
Pollyanna is the story of an orphaned daughter of a minister who is sent to live with her Aunt Polly, a wealthy lady who practically owns the town of Herrington. Pollyanna was blessed with a cheery disposition and a gift to see the good in almost every situation, but she is placed in a town of mostly miserable people who tend to see the bad in everything. Aunt Polly gives Pollyanna a room in the attic, as far away from her as possible. Pollyanna soon befriends Aunt Polly's staff and an orphan boy named Jimmie Bean. As she spends more time in Herrington, she starts to change everyone's attitude. She convinces an old hypochondriac to get out of bed and live life to the fullest, a curmudgeonly man who lives alone to change his ways and a reverend who strikes fear into his congregation to preach good news to his followers. When the town throws a big charity bazaar to help build a new orphanage, Aunt Polly doesn't let Pollyanna go because she disagrees with the cause. Jimmy Bean convinces Pollyanna to sneak out by climbing a tree, but on her return trip home, she falls and paralyzes her legs. Aunt Polly's old love, Dr. Chilton, says that they can perform a surgery to fix Pollyanna, but they will need to lift her out of her depression for it to be successful. At that moment, the entire town shows up on their doorstep to shower Pollyanna with gifts which cheers her up as Aunt Polly and Dr. Chilton, now a reunited couple, take Pollyanna to the hospital on a train. Walt Disney's Pollyanna was released on May 19th, 1960. Critics instantly applauded it as the best live action film that Disney had ever made. However, box office results fell short of expectations. The film cost $6 million to make and it earned just over $3 million in theaters. Walt attributed the low grosses to the title, which he thought sounded to "sweet" for boys to want to see. However through several TV airings and the inception of home video in the 1980's, Pollyanna has garnered a significant fan base and is now heralded as a classic, a title it more than deserves. I first saw Pollyanna as a kid when Disney Channel still played classic Disney movies. I instantly fell in love with it, even at a young age. If I had to make a list of the ten best live action films that Disney ever made, Pollyanna would definitely be on that list. In the 1980's Disney made a TV musical version of the story with an African American cast called Polly. It was so successful that a sequel was made titled Polly Coming Home. Pollyanna was released on DVD in 2002 as part of the short lived "Vault Disney Collection." This wonderful 2-disc set presents the restored film in its original widescreen aspect ratio and attempts to recreate the theatrical experience by playing the short cartoon that accompanied the film in its initial release. Some wonderful bonus features fill this deluxe set, including a making of documentary, a commentary by Hayley Mills and David Swift, information about the era in which the film takes place and many more features that are sure to delight every Disney fan. The DVD is still available. The film is also available on iTunes in widescreen and with the option of buying it in HD.